Steven (Chicagoland, United States) on 31 December 2009 in Architecture and Portfolio. Located at the opposite end from the altar at St. Anastasia Church is its choir loft, which also has additional seating for parishoners. What is interesting to note is that the west wall is composed of strictly blue stained glass, rather than a variety of colors seen on all other walls. Seen here are pews which were sanded and re-finished with a lighter oak stain. The original color of the pews was the same as the main entrance doors seen in the center here. I love the wood grain seen in the pews, which was highlighted nicely through HDR treatment. See the same photo, which was not treated in HDR here. I wish you'd stood exactly in the middle. Still, a bright and clear shot! Let me wish you a very happy and lovely and peaceful NEw Year ! All my best wishes Steven ! At first glance the symmetry struck me, only to discover the organ has a pointed roof and the altar doesn't. The lighter shade of the benches makes this church timeless. Excellent! Wishing you a wonderful 2010! Wow Steve this is a belter, although normally I'm not keen about what HDR does to red bricks, it seems to have worked nicely in here - best wishes for 2010. Inspiring through your eyes! Happy New Year Steven! This is a much better image. I must start using this technique. Happy New Year! Marvellous shot of this remarkable church! The round arches remind me of many brick churches here. 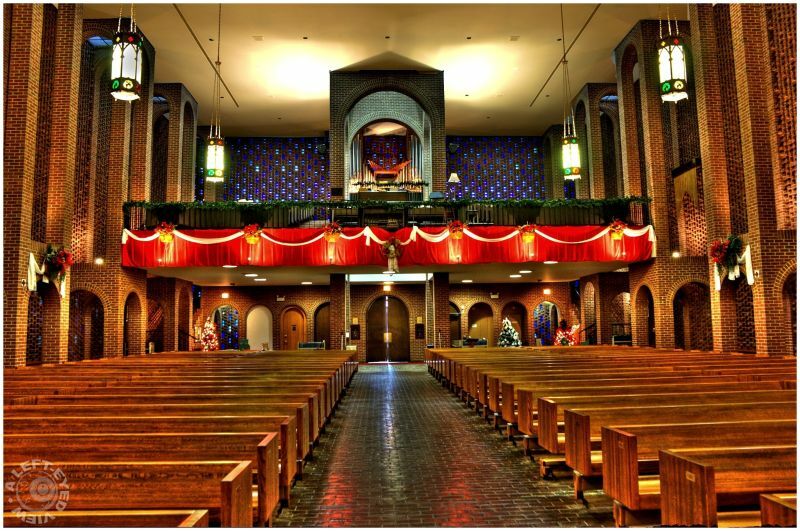 i grew up in waukegan,il, and this was my parish. life has taken me away from here, but i'll always keep st anastasia church in my heart. was looking for an interior image of this church, and found this. many happy memories-here. we used to give a christmas concert on the alter, singing hymns in english, german, french, italian and latin. thank you to whomever posted these photos, they mean a lot too me.